Miami Dice (one of a pair), after Mallarmé. 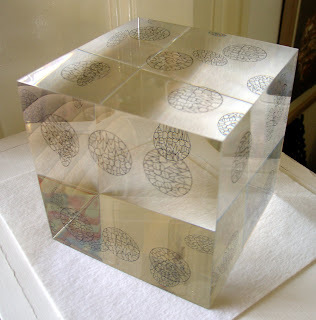 12.5cm cube, 2003. A quick trip from Princeton in November to see my friends and supporters for over thirty years, Ruth and Marvin Sackner. Boldly they moved (and well) as their fiftieth wedding anniversary approached, from Miami Beach to the penthouse of an apartment block in Miami itself. Great deflectors of attention, their celebration of both events is disguised as a party in my honour. suffice to say that all was perfect: but the moment arrives when I must make a speech, instructed by Ruth and Marvin not to talk about them but of myself. I have to ignore this injunction since what I say will contain my anniversary gift. Somehow a work of mine would not have been right; their walls are already lined, their shelves heaving with them (as you can imagine if you check the Sackner Archive). I have instead devised a cocktail with the help of my friend, that prince of restaurateurs, Jeremy King who knows a thing or two about such matters and, moreover, knows that I know nothing. Crikey. Mallarme and Crockett & Tubbs, and exotic parties apparently directed by Peter Greenaway (we really want to know what was in the party bags...). It's been 30 years since I read Un coup de des, and the connections between it and A Humument had never struck me before (duh). However, the Mallarme has not improved with age, and A Humument is prettier and funnier. One of the pleasures of following the aleatory tendency in your work, Tom, is that it seems to reveal not a stark, fearful, randomised universe of chance (argh), but rather a playground governed by a mischievous but benevolent hidden hand (there's something very Shakespearean, very English about that).